The News: Mark Cuban, owner of the National Basketball Association's Dallas Mavericks, has issued an apology to Trayvon Martin's family after telling an interviewer at a conference, "If I see a black kid in a hoodie on my side of the street, I'll move to the other side of the street." The often outspoken Cuban has received criticism for the remarks, delivered to a group of business owners gathered in Nashville, Tenn., earlier this week. Cuban and his fellow NBA owners are scheduled to vote June 3 on whether to strip Donald Sterling of his ownership of the Los Angeles Clippers. Cuban has said that Sterling's racist remarks are "abhorrent" and that the NBA, or any of the other businesses he owns, is "no place for racism." The Take: If Cuban really crossed the street whenever he saw one of his bogeymen, he’d never get anywhere. Good thing he can afford a driver. He seems to be coping quite well with his fear of black guys in hoodies, or he would have cut most of his own players. I'm sure it helps that when not wearing hoodies, his black players have won Cuban a league championship, made his Mavericks one of the most valuable NBA teams and turned him into a celebrity. But let's not confuse ourselves about Cuban's bigotry. It doesn't come from the strain of unrepentant, "men of a certain age" racism expressed by Sterling, in no small part because Sterling institutionalized his bigotry in his business practices. Cuban, by any account, has committed no such sin. Cuban is like every other American. He has biases. Bias exists in each of us. It is an essential function of the brain, an early survival instinct to distinguish friend from foe, and today a tool we use to categorize people and experiences. “Categories,” as Tolerance.org explains, “give order to life.” So biases can be helpful. Negative biases are the building blocks for stereotypes and prejudices. We adopt and hold most of them implicitly, meaning that we don't realize the significance of what we've learned. Researchers call it mental residue: "People can be consciously committed to egalitarianism, and deliberately work to behave without prejudice, yet still possess hidden negative prejudices or stereotypes." Even the most socially conscious people act on these biases, as with sexism within the civil rights movement or the so-called Bradley effect among liberal white voters. We should appreciate Cuban for admitting his biases rather than cloaking them in denial, as do most other Americans. He didn't defend his beliefs, minimize them or justify them as an inevitable, unchangeable result of his upbringing. He owned it, and in the process opened himself to a constructive discussion. It's understandable that his comments shocked and upset some people. But it's interesting that he hasn't been roundly vilified. No NBA players are demanding his ouster from the league. NBA Commissioner Adam Silver won't be trying for a twofer when owners vote out Sterling next month. Why? Because most of us recognize sincerity when we see it. What came through was Cuban's genuine desire to acknowledge and confront society's prejudices, starting with his own. We will never be able to openly discuss race without first accepting that it is interwoven in American culture and in how all of us think and behave, often without our realizing. Cuban took responsibility for sharing in the legacy of prejudice, and he did it voluntarily. More of us must. Then we can have that meaningful dialogue, free of the threat of ridicule or career ruin. 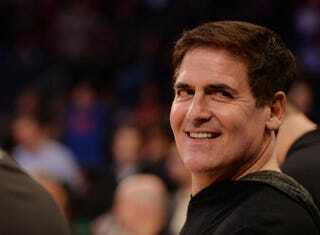 "The full Mark Cuban," as he described his comments, gave us a case study in how to start the conversation. Think you don't have biases? Take this test and you might change your mind.